As technology and the newest generation continue to enter the workforce, offices are becoming increasingly less static. Take a step into a newly-designed open office and you will find that workers can seamlessly cycle through various work modes with great ease. Matched by the shift toward open office environments, more focus has been given to employees’ ability to go from one working area to another, meaning less individual space and more areas dedicated to collaboration. Why the shifts in workspace change? While much of the reason leans on Millennials hitting the work force with a desire for more flexible workspaces, technology is a large source of this shift as well. With more people having access to laptops, wireless connections and smartphones, mobility and flexibility for employees are endless. A commonly held belief about moving towards a more open collaborative environment is that it will lead to a lack of privacy and increase in distractions. Employees must maintain the ability to focus during heads-down work time, but also have the freedom to collaborate. When well designed, a space can strike the balance between fostering collaboration and providing the required privacy needed to fit a company’s culture. The so-called “cubicle” is a relic of the past, and today’s version is designed in a way that has a more functional and collaborative approach coupled with supportive technology. The dividing panels are getting lower, movable whiteboards are placed between work areas, and the office footprint is shrinking while becoming more efficient. 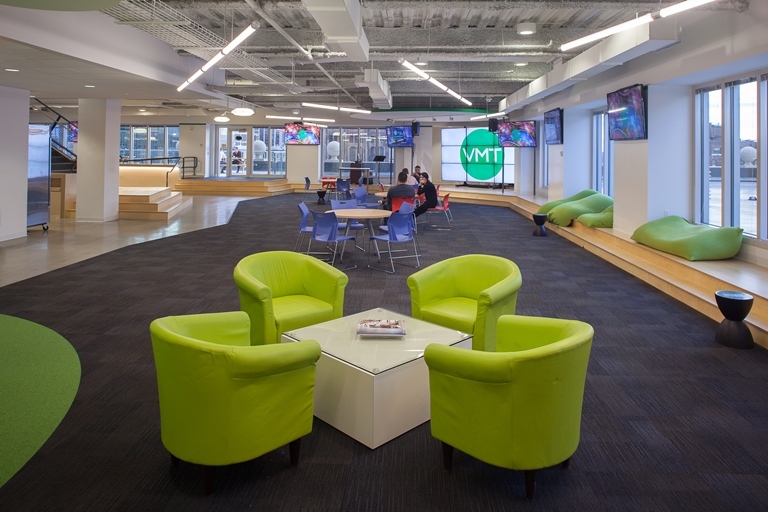 Our team has completed office spaces that essentially “busted this myth” as these companies looked to incorporate more collaborative open office environments into their new office designs. The architectural elements featured in 128’s new workplace encourage movement through the space inspired by the 128 Expressway located outside the office’s building, along with strategically placed “intersections” that incorporate collaborative areas for casual encounters. The open workspace allows for growth and includes a large lunch and lounge room, reception area, collaborative spaces with moveable whiteboards, engineering team rooms, and conference rooms with audio visual capabilities. 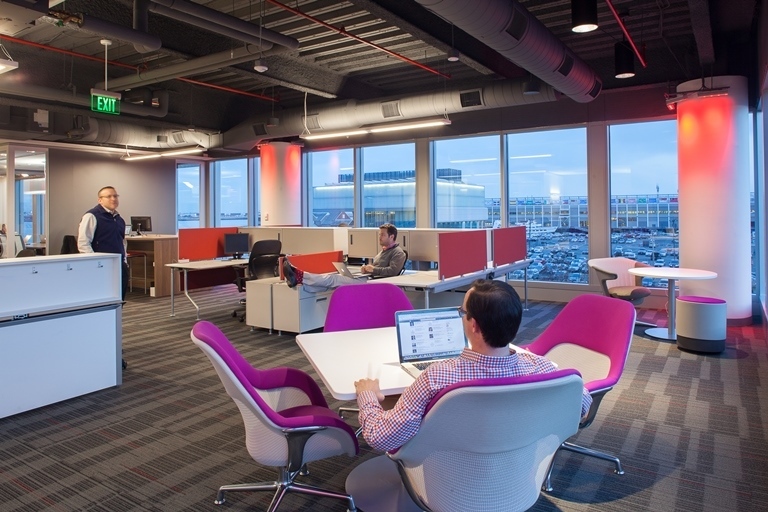 To create T3’s effective and unique workspace, Visnick & Caulfield integrated design elements of productive, working environments with the personalities of its employees. By replacing private offices with touch-down areas, the open floor plan of the space allows for flexible collaboration throughout. Keeping in mind T3’s company culture, the workplace includes both work and play by hosting an open floor plan that further serves as a multi-functional space for large events, from early morning yoga sessions to after work cocktail parties. 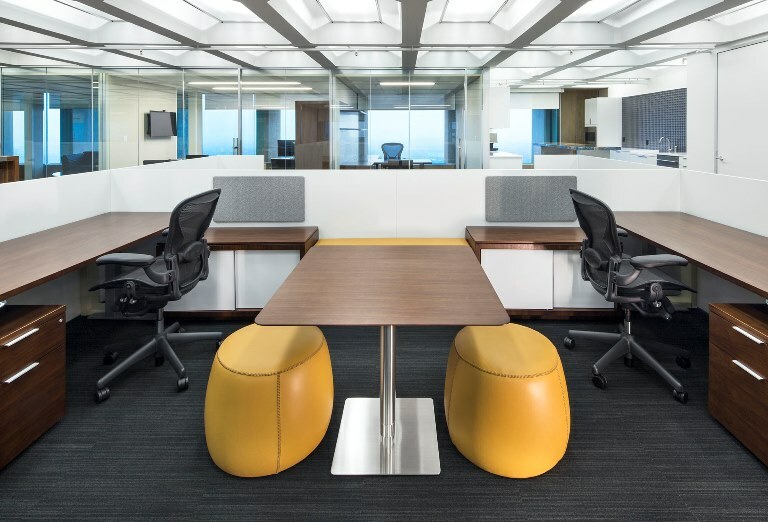 Kensington’s workplace is designed to create a modern space that complements the personality of the original building at 177 Huntington Avenue, originally designed by I.M. Pei & Partners in 1973 as part of the Christian Science Plaza. Although outfitted with what appears to be traditional workspaces, a closer look will reveal collaboration areas between each work surface for impromptu meetings with team members. The shift towards open office is spanning beyond its original roots in the technology sector, as many offices across industries are reaching for the benefits of greater square footage efficiency, natural light, and the ever-important employee collaboration that fuels success. The flexibility of the workspace reflects the flexibility of the worker, who throughout the day can be found accomplishing a greater array of tasks than ever before. 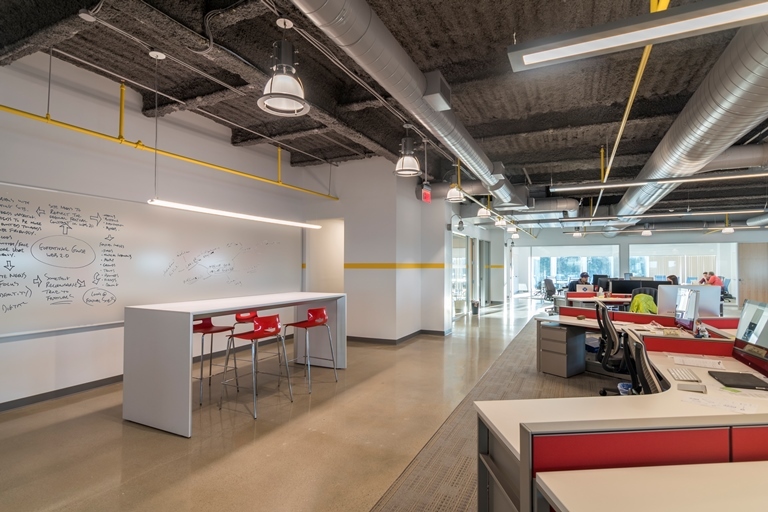 Visnick & Caulfield continues to provide design that aids a company’s desire to build and sustain through a focus on shifting technologies, individualized workplace cultures, and strategic use of collaboration.